More than 55 community members and dozens of high school students came together recently to consider what a Stillwater graduate should look like. It’s all part of of a community-wide effort to define the Portrait of a Graduate, an important document that will be the foundation of the school district’s next strategic plan. Read more. The high school may look big on the outside, but on the inside teachers and staff are working hard to make it feel small, safe and welcoming for its new class of ninth grade students. Teachers are connecting with students like never before, and getting to know them personally as well as academically. It’s all thanks to the Freshman Academy and a new program called BARR (Building Assets, Reducing Risks). Read more. In the midst of a busy day of learning, Lake Elmo Elementary students can be found taking a quiet moment to slow down, breathe deeply and find their balance. It’s all part of an effort to help students learn better by teaching them to care for themselves and others. 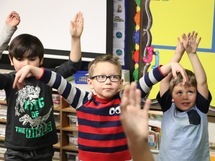 Students are learning basic yoga practices to help them develop self regulation skills, manage strong emotions and build physical and emotional strength. Read more. This month, as part of their advisory classes, middle school students are learning how to appreciate differences in the people around them. Check out the latest Let's Talk video to hear what appreciating differences looks like and learn how you can support this valuable attribute at home. Da Vinci Fest is fun for the whole family! Join us for Da Vinci Fest, Saturday, Jan. 6, from 1-5 pm. This year’s Da Vinci Fest is going to be out of this world! 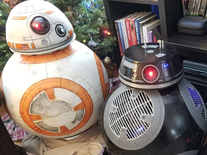 See droids - like the ones in Star Wars - screenprint, simulate a tornado, observe a Native American Story Walk, explore films and podcasting, raptors and styrofoam-eating mealworms! Lie on a bed of nails or listen to poems and improv and see the amazing science and art creations from students in the Stillwater area. The 3M Wizards and Curio Dance will also perform! Da Vinci Fest is free and open to the public. Learn more. Sponsored by The Partnership Plan and Stillwater Area Public Schools. It's time to nominate this year's Distinguished Alumni! Do you know of any Stillwater Area High School alumni who are making a difference in the world? Make sure they are recognized for the amazing work that they are doing! The high school, in cooperation with The Partnership Plan, is accepting nominations for the 2018 Distinguished Alumni Award. Nominations are due January 31, 2018. Winners will be announced this spring and recognized as part of the Class of 2018 commencement activities. Nominate someone today!